This is a documentary about rapper Snoop Dogg on his journey of self discovery in Jamaica where he attempts to find a new, peaceful reggae sound away from the aggressive beats of his hip hop back catalogue. I’d rather have seen Dr Dre try and reinvent himself as a folk singer by living with Romany Gypsies for a month, but whatever. Unintentionally hilarious, this documentary follows Dogg, who must be one of the most absurd people in the world today, as he wanders around the Caribbean in a drug-fuelled haze. His rule on the journey seems to be “if in doubt say ‘love’ or ‘peace’.” At one point he’s working with Bunny Wailer (of the Wailers), but Bunny’s concerned the reggae thing might just be a gimmick. Dogg reassures him by saying “love” and “peace” a few times. Luckily Bunny has smoked even more weed than Dogg so buys it right away. Wow, that sentence sounded like a really weird Beatrix Potter story. And it’s here that we see the real purpose of Dogg’s “trip”. He just loves to smoke the ganja, which he does in almost every scene in this film. He must be one of the most baked people in the world, and it shows in the way half of what he says makes no sense at all. Most of the time he looks like he has no idea what’s going on, then opens his mouth and sounds like it too. The only reason the people around him don’t give him a strict talking to is because they’re as stoned as he is, which is, perhaps, the secret to Dogg’s success. It would be far more honest for him just to make a documentary about weed and be done with it. Because it’s told through the eyes of Dogg it’s the most stereotypical view of Jamaica possible, where everyone smokes grass by the truckload and sings reggae at every opportunity. If the Jamaica of this film was real there’s no way they could have a system of government, law and order, infrastructure or civilisation of any kind. “He was one of the first hip hop stars I came across who was a big herb advocate,” says Damien Marley, “and that’s something a lot of Jamaican people can relate to.” Quite. 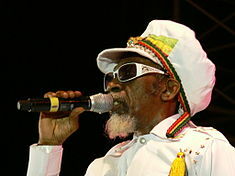 His obsession with “herb” is as incredible as his belief that he’s a rasta and that all Jamaicans are his family. In one bizarre scene he stands on the roof of a building while a hundred or so people look up at him, taking photos. He thinks his brethren are welcoming him back to the motherland, temporarily forgetting he’s a world famous celebrity. At another point he visits a centre for disadvantaged children where they play reggae music, but with little to contribute musically he just dances round the room like there’s no-one else there as the children look on in amazement. When he sings reggae in a fake Jamaican accent he sounds like Ali G. In fact, his entire pilgrimage to the Carribbean smacks of parody, or would if there wasn’t the background knowledge of Dogg as an established eccentric. Watching him attempt to sing reggae while dressed as Jimmy Savile among loads of genuine rastas is cringe-inducing. For what it’s worth, I don’t think it’s an act. He really is this ridiculous and lacking in self awareness. All this tomfoolery is inter-cut with information about his past, where it’s clear that Dogg has more authenticity. The violent culture he came from has led to the deaths of many of his friends, and he has served time in prison on several occasions. 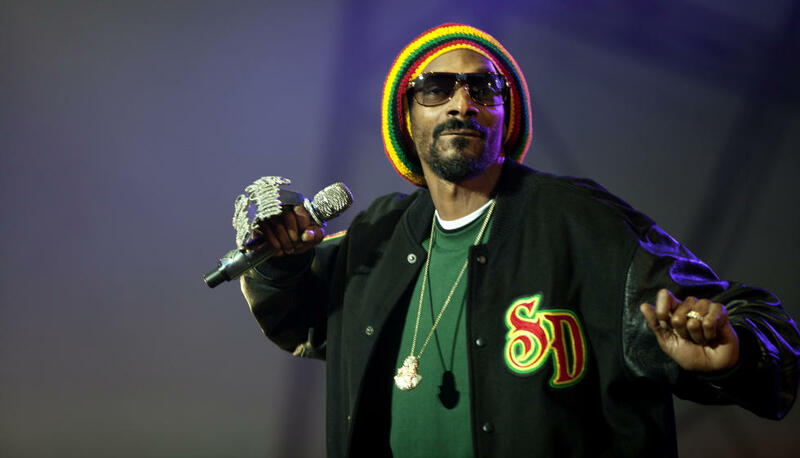 The rap wars of the 90s were real, and Dogg was caught in the crossfire. He comes from a very tough background; something which comes across in Reincarnated. But this just adds to how strange his Jamaican reinvention is when he talks with the same sincerity about his connection to Bob Marley as about the death of his friend Tupac. It’s not helped by the inclusion of some of his truly awful reggae music, mostly in the form of weirdly preachy songs like No Guns Allowed or heavy handed sentimentality like Ashtrays and Heartbreaks. While this “doggumentary” is designed to show Dogg’s enlightenment and reformation, with his stoned journey around Jamaica cut with stories from his deprived past, it just shows how far he’s come. An LA rapper genuinely involved in the crime and violence that inspired his lyrics and cost the lives of many of his friends, to self indulgent megastar who surrounds himself with people not prepared to stop him pursuing his absurd ideas. It’s like a before and after about the effects of a dangerous cocktail made from cannabis and fame. The final scene of this film sums up Dogg’s charade. As he steps onto the stage in his gangster get-up, holding a bling Snoop Dogg microphone, sporting a novelty rasta hat, in front of the adoring crowd of smartphone wielding youths he declares “Jah! Rastafari!”. Transformation complete.